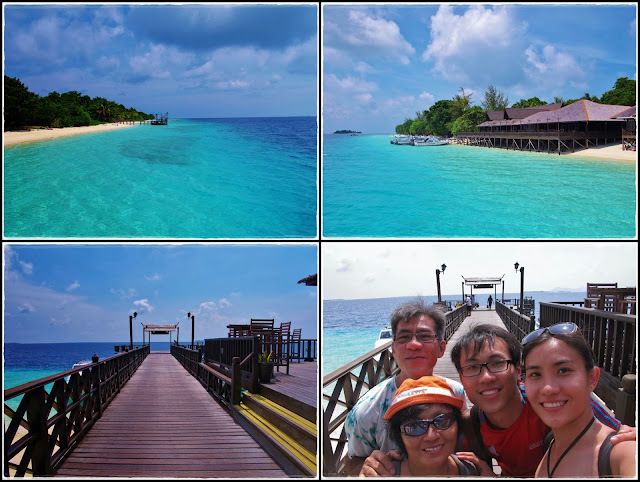 Right after returning from my work trip to Beijing, I flew straight to Sabah for our family trip. 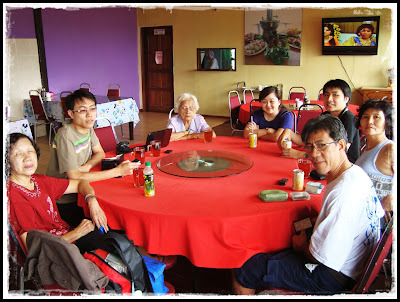 In fact, mom booked the tickets for Tawau back in January and what coincidence that my overseas work trip was scheduled on the same week. Yeah tell me about good timing. I thought I was gonna miss my flight to Tawau when my flight from Beijing delayed for an hour but fortunately, I made it to LCCT just in time after running around like crazy woman from airport to airport. 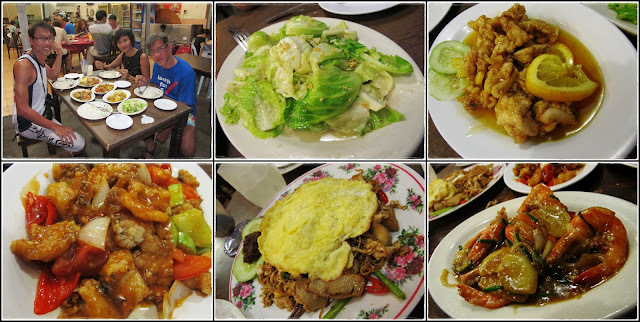 Even though we've booked our air tickets 9 months ahead, we didn't plan out our itinerary until 2 weeks before the trip. 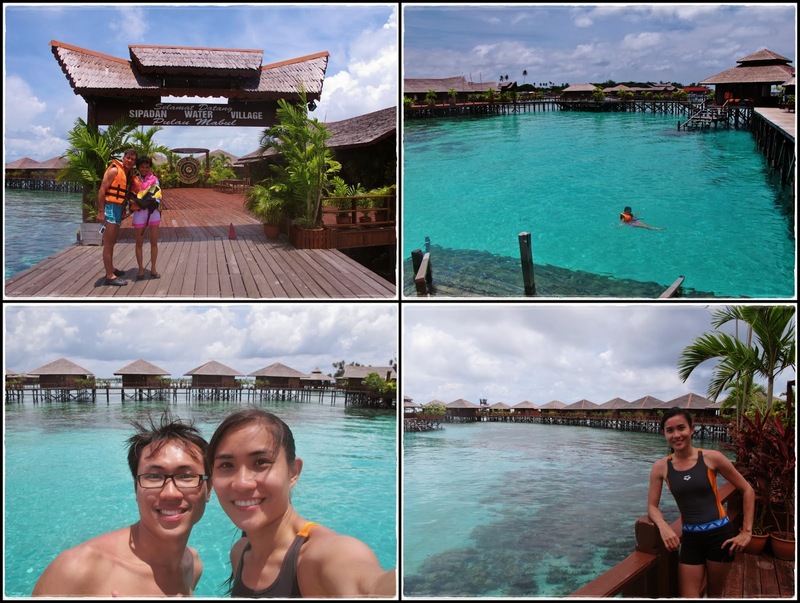 Thanks to bro's slowness, we didn't get to splurge and stay in the water villas coz it was fully booked but instead we managed to work out another better itinerary that allowed us to have the same experience at a much lower cost. =) OK enough of words, time for lotsa 'blue' pictures! 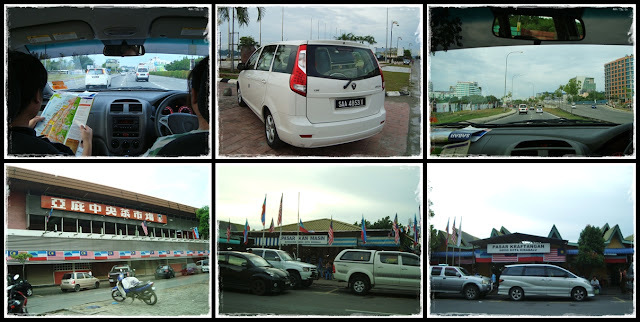 I arrived Tawau one day later than my family due to my work schedule so bro arranged for this Mataking van to pick me up from the airport to Semporna. I was napping throughout the 1.5 hour journey from Tawau airport to Semporna coz I was too tired from the overnight flight and the mad rush to catch my flight. 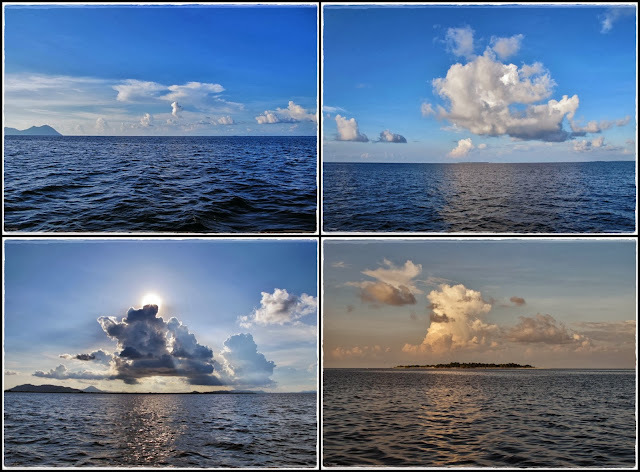 I was too hyped up and was taking photos non-stop during the 45 minutes boat ride to Mataking Island even though it was all the same sea, sky, and clouds. Too much of influence of 冲上云霄, I'm obsessed with clouds...lol!! 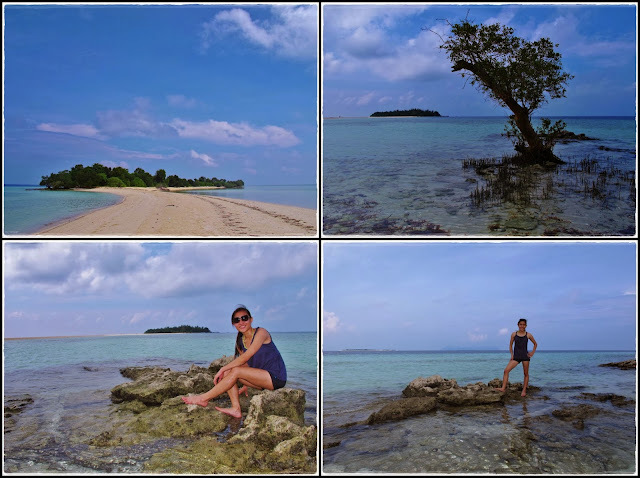 After traveling for 20 hours by flights, cabs, van, and boat, I finally arrived Mataking Island at 5.30pm! Pheww...what a long journey!! We received a warm welcome by the hotel staff playing guitar and singing, wet towel to freshen up, and lemonade as welcoming drink. 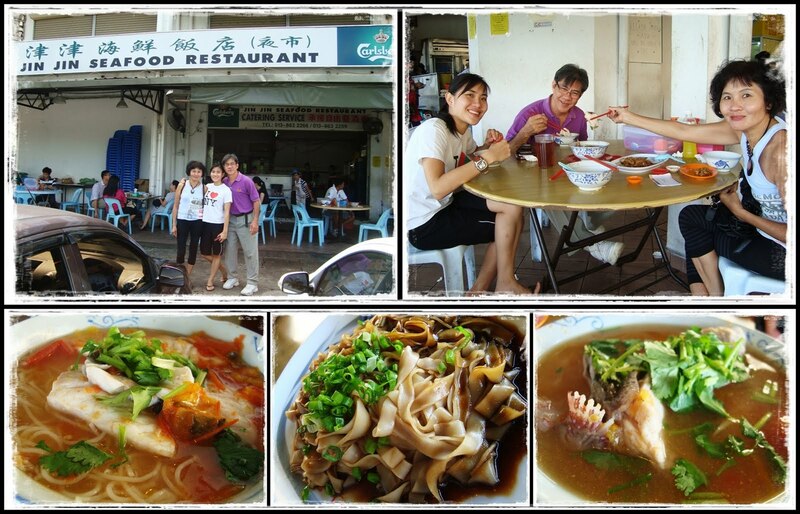 Haha...felt like I was in the movie set of 夏日嬷嬷茶 or 夏日乐悠悠!! 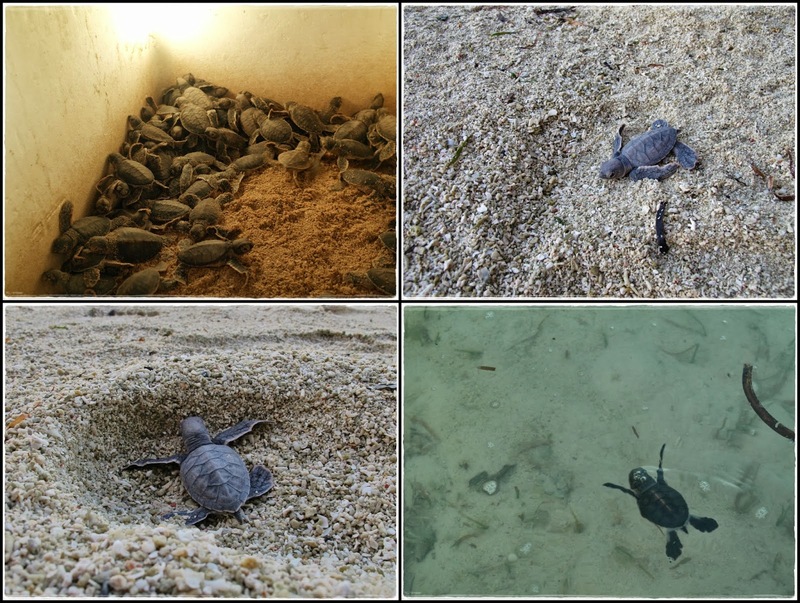 I arrived just in time to catch the baby turtle release activity...swim turtle swim!! Wanted to see the sunset but it was too cloudy. I was looking pretty haggard coz I haven't even had time to go into our hotel room yet since I arrived. 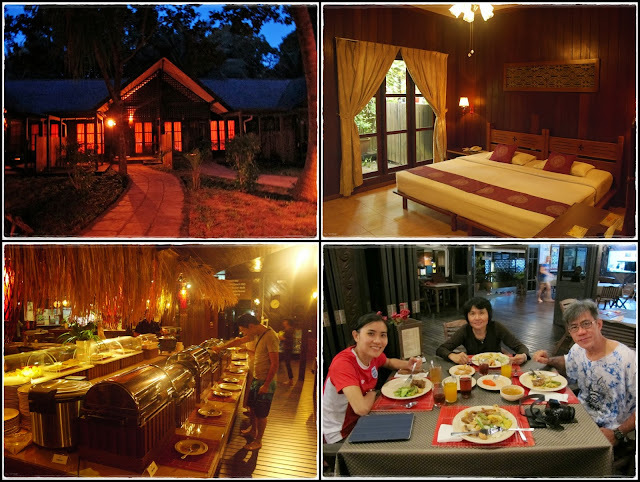 Our Malay-style chalet. 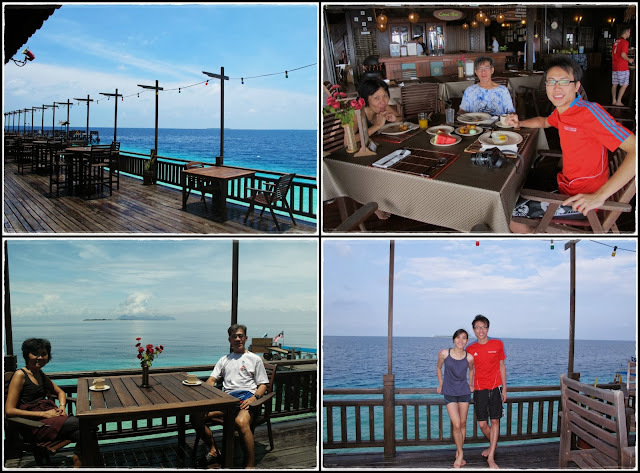 All meals are covered under the 2D1N package that we booked for the Reef Dive Resort. 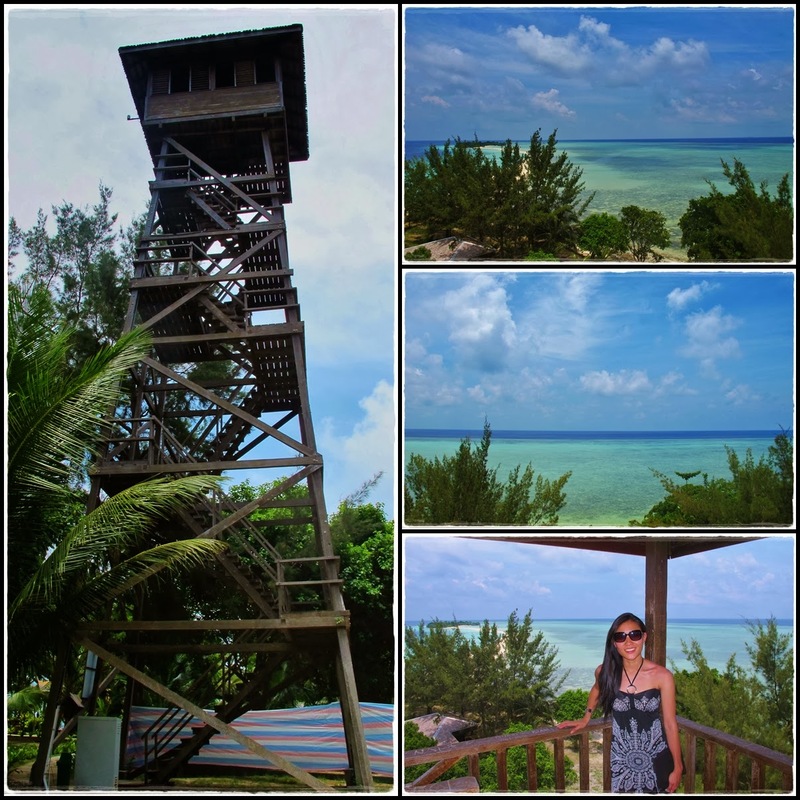 Climbed up this watch tower hoping to get a good aerial view of the island, mana tau the view was all blocked by trees...what a waste! Can't stop taking pics of the beautiful sea...so many different shades of blue!! 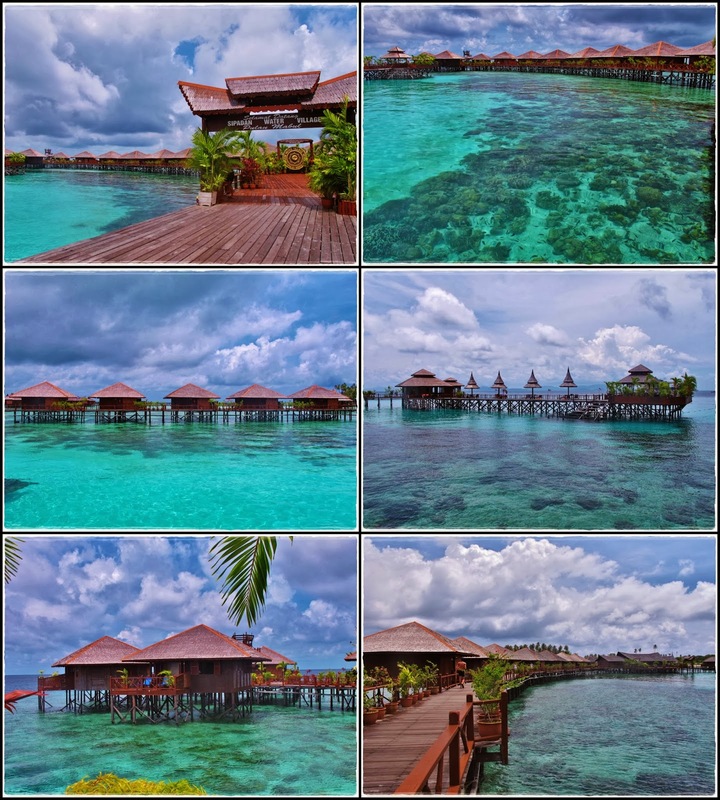 This is definitely a perfect place for a tranquil and relaxing vacation. 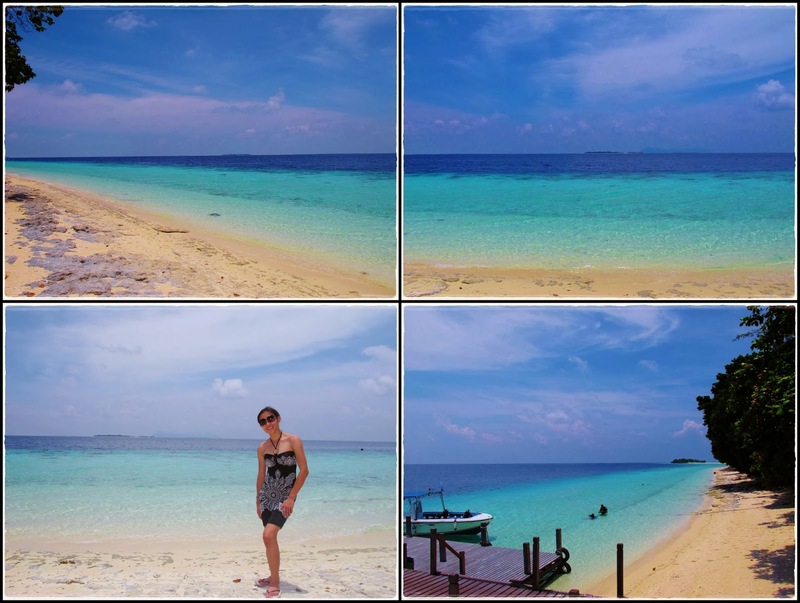 Can't get enough of the clear blue sea. Last glimpse of Mataking before leaving and head back to Semporna. 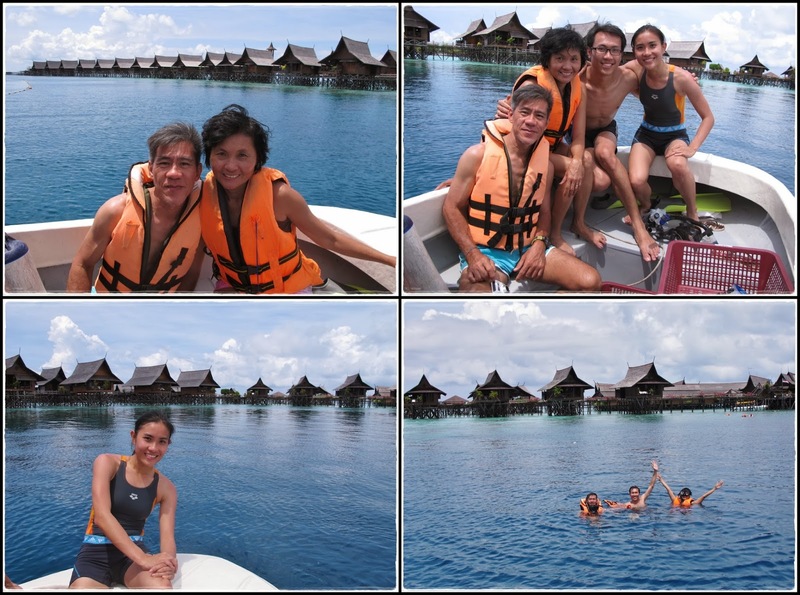 Goodbye Mataking! 1st round of barbeque completed...more to come tomorrow! 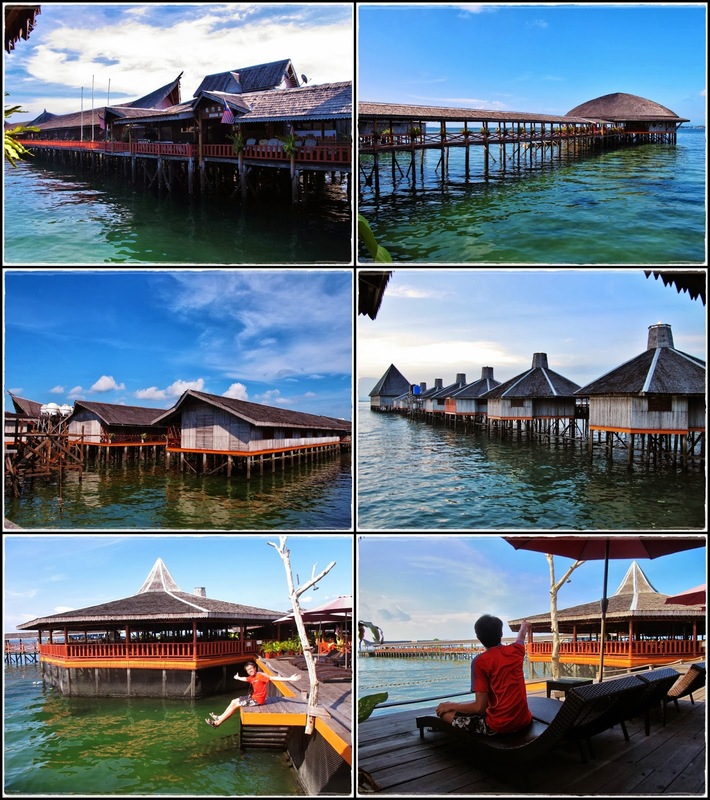 We didn't get to stay in the water villas in Mabul but we've got our very own over-the-water family suite bungalow here...not bad huh! 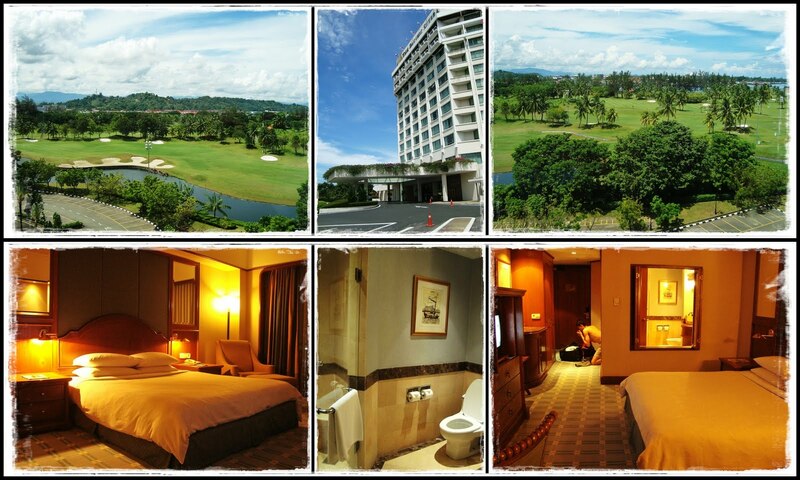 =P The exterior of our room looks much better than the interior...haha!! 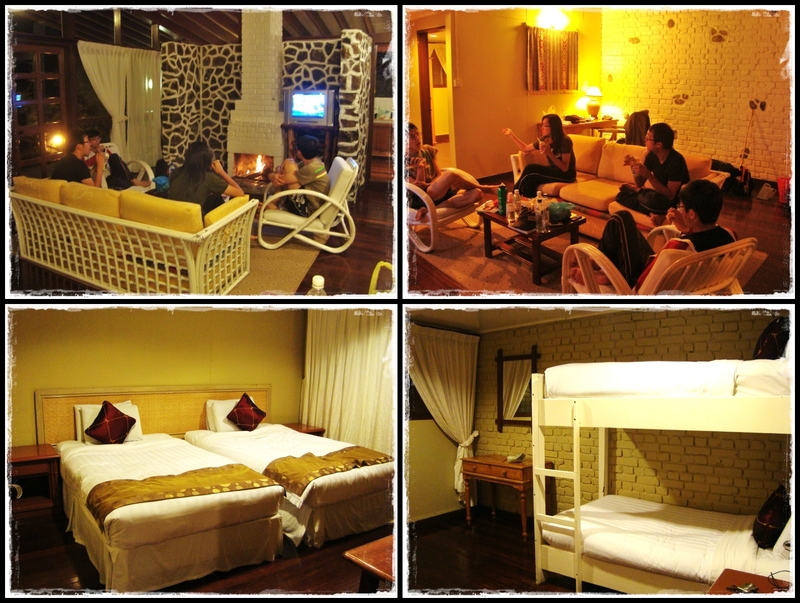 See how we transformed the room to make ourselves at home...we even had our own clothes hanger...lol!! Our hotel lookin' picture-perfect at dusk. Night-view of our hotel from where we had our dinner. 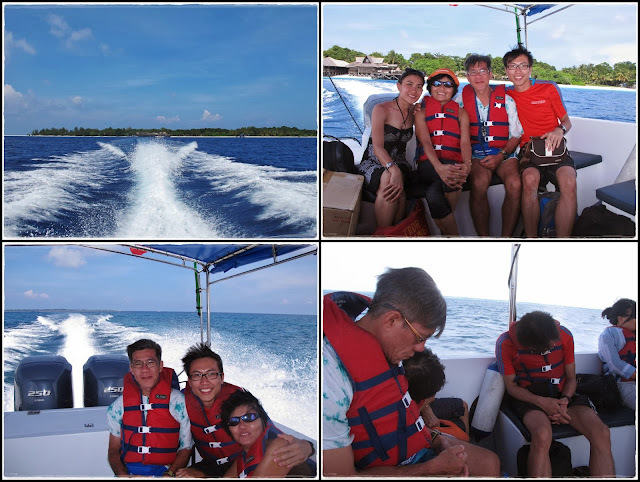 Chartered this boat for a day to bring us to Mabul and Kapalai Island. 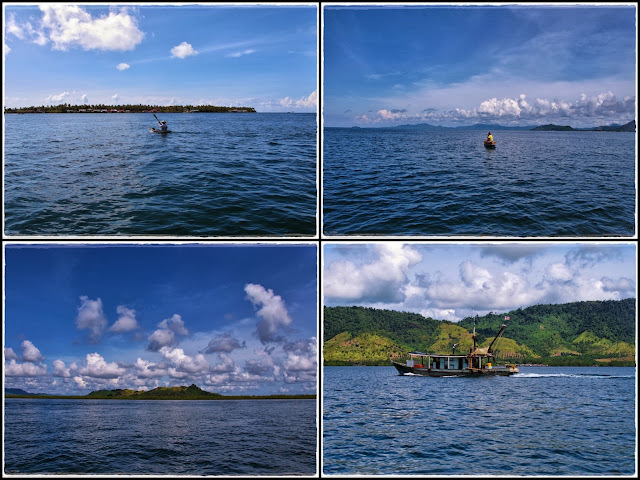 Scenery along our 1-hour boat ride to Mabul Island. Beautiful day for sightseeing and tanning. Here's a demonstration by bro on how to sunbathe on your private boat...lol!! 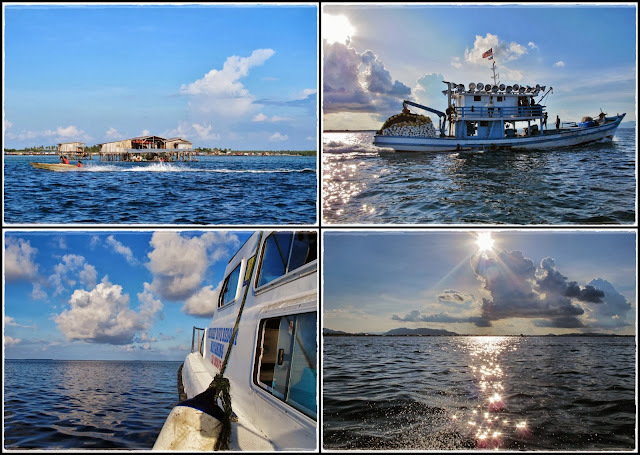 Arriving Mabul Island to get our snorkel equipment. 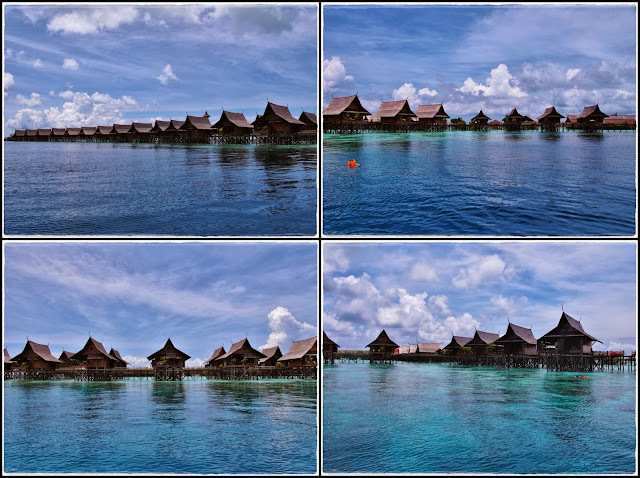 You must be wondering...so are these the so-called water bungalows that I was talking about earlier...comparable to Maldives?? 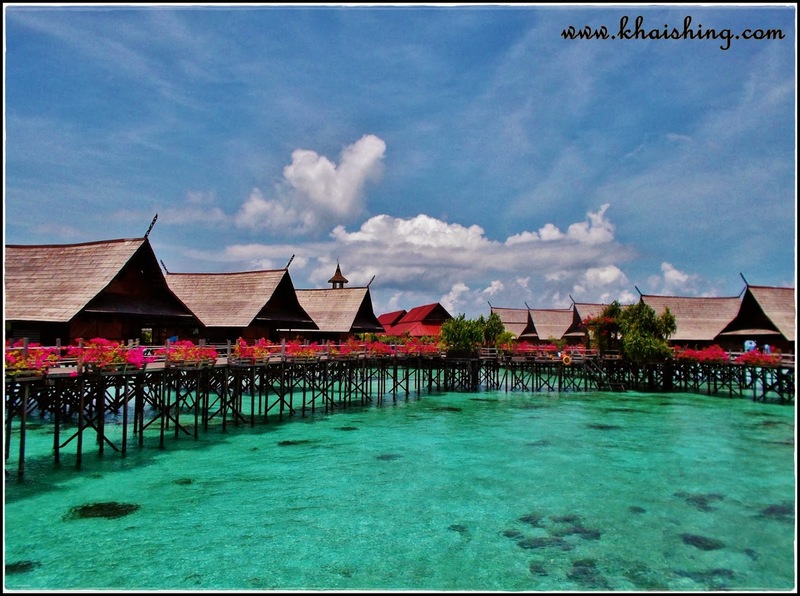 This is the 'reality' side of Mabul...Mabul village. 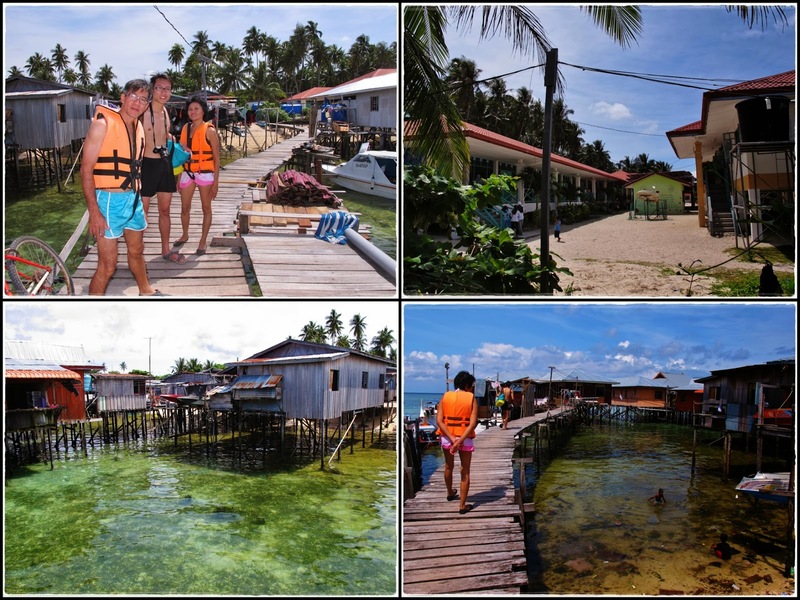 Seems like tourism hasn't benefited this immigrant village at all. 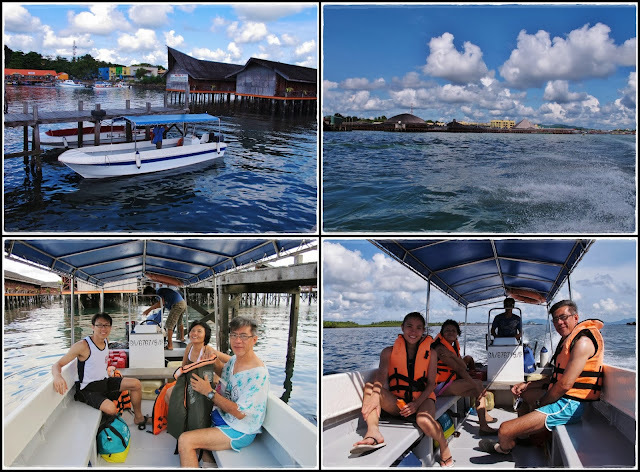 Our boatman decided to bring us to Kapalai island first so keep scrolling down to see the 'fantasy' side of Mabul. This is by far the best place I've been for snorkeling! 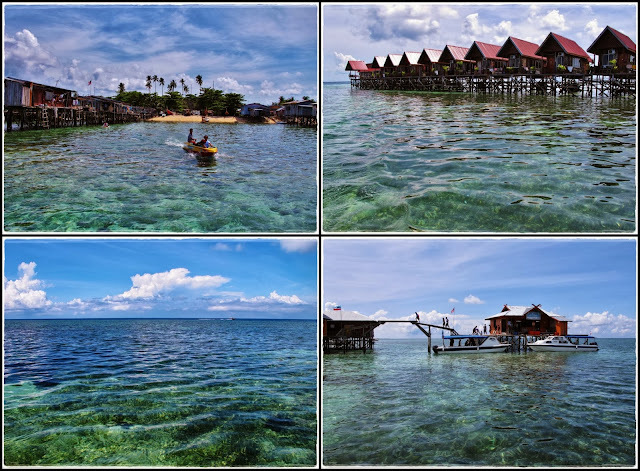 What's better than being surrounded by such amazing landscape while you snorkel?? Haha...apparently I was more interested in what's above the sea than what's in the sea...lol!! Notice those kids in that boat? These Sea Bajau kids are one of the most photographed people at Mabul Island and I bet they don't know that their pictures have gone viral on the internet. We were observing them for awhile and noticed that they were actually begging for money from the tourists. Oh well, this is the sad fact about tourism. 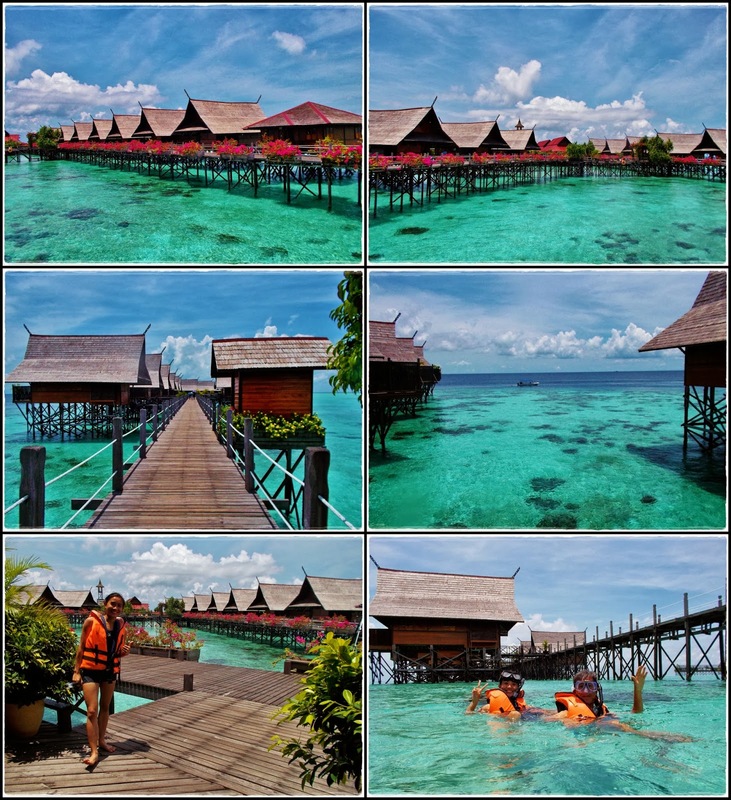 Mom was enjoying her 'private' pool on the top right pic while bro & I walked around the hotel taking pictures. We noticed that majority of the tourists that come to these islands are Chinese tourist. 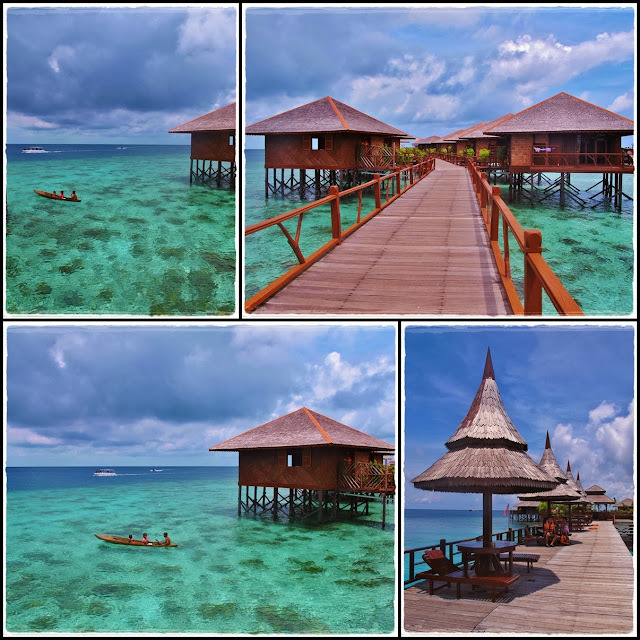 Good thing is most of them come here only for photos, not to snorkel or dive, so even though the hotel is fully booked, you don't really see people around when it's hot and sunny...haha!! Now this explains how we got so 'barbequed'...lol!! Another interesting hotel near Mabul island is this Seaventures Rig Dive Resort...it's a converted oil rig. 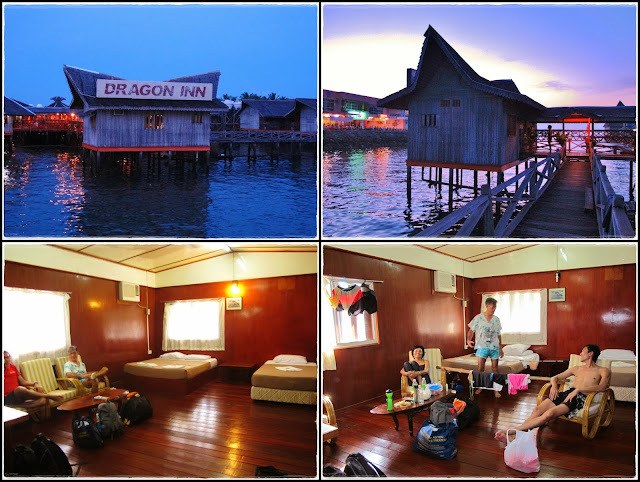 This hotel looks kinda scary...imagine falling off the platform!! 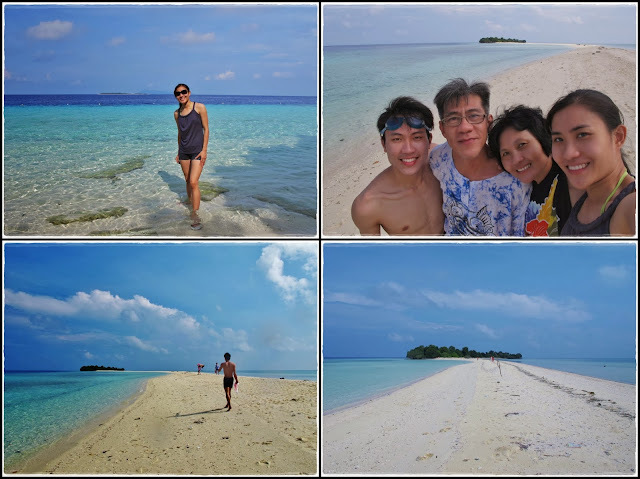 =P We didn't go to Sipadan island this trip coz there is a permit system limiting the number of visitors per day and Sipadan is more suitable for people who dives. 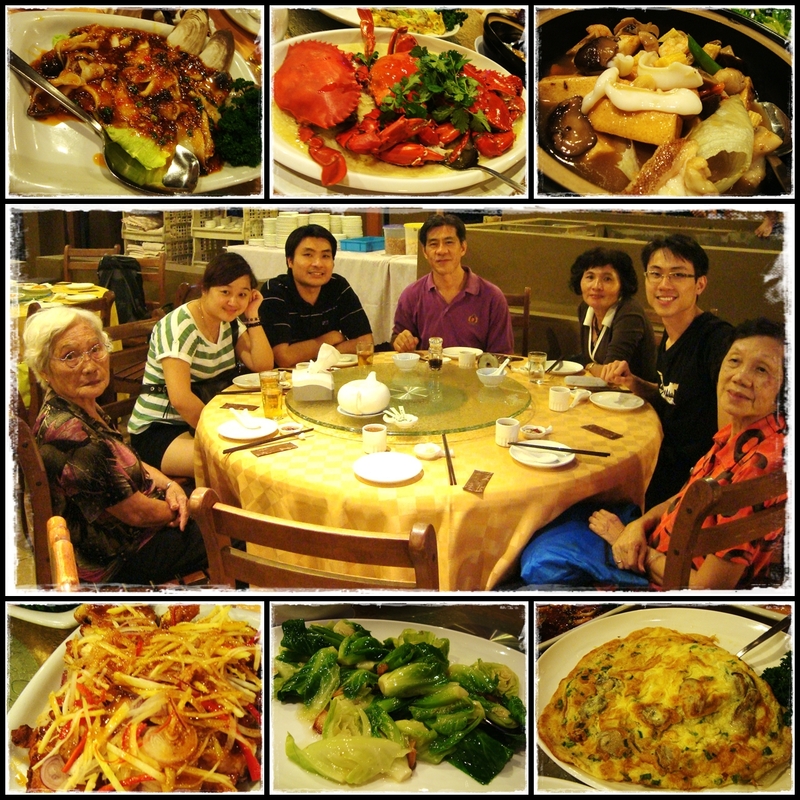 Dinner in Semporna. We were all 'barbequed' from being out in the sun all day. 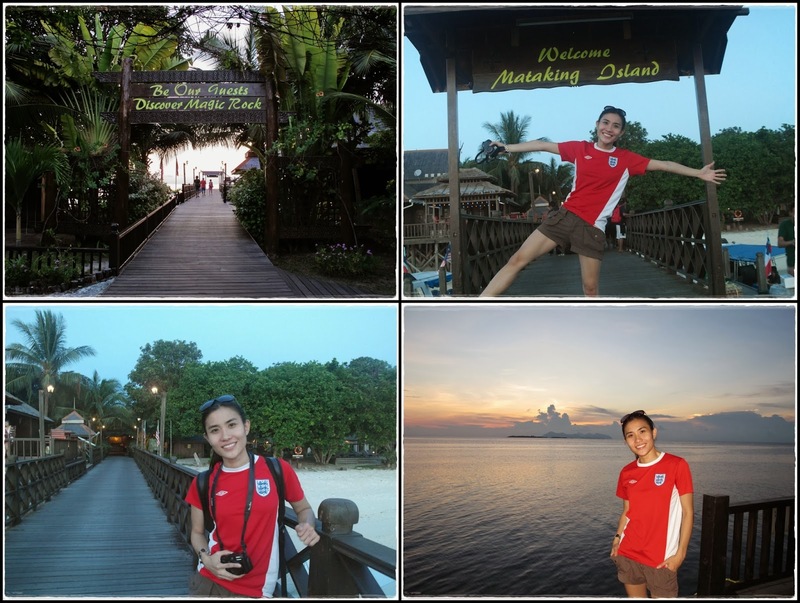 That's all for my 4D3N Borneo trip. Very satisfied with this trip coz I managed to see the places that I wanted to see and managed to take lotsa nice pics at this paradise. =) For all those who have yet to been to this part of Malaysia, you should totally visit this place as soon as possible before the serenity, tranquility, and natural beauty is ruined by tourism. 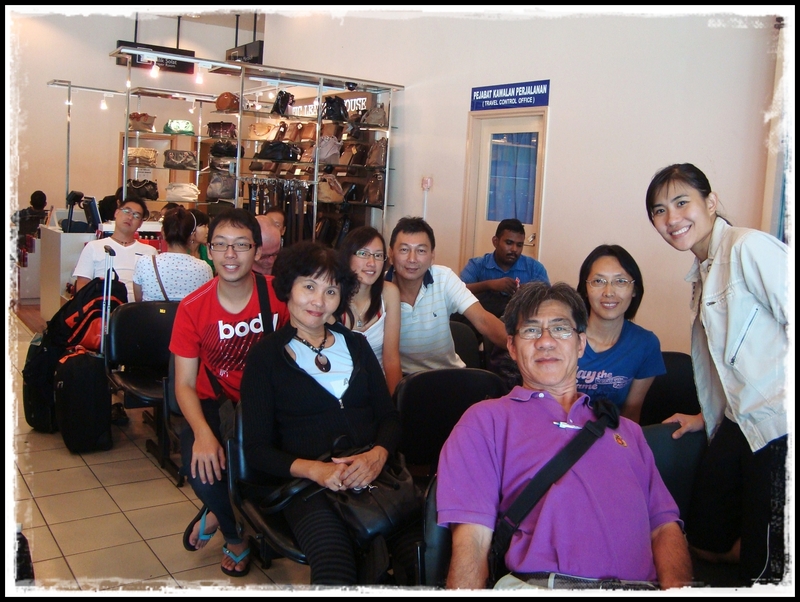 It's been 2 years since our last family trip to Bali. Thanks to mom for hunting for cheap airfares again earlier this year...we got to go on another family trip...this time it's Sabah!! This was my first time traveling across South China Sea to East Malaysia after 24 years...what a shame...haha! 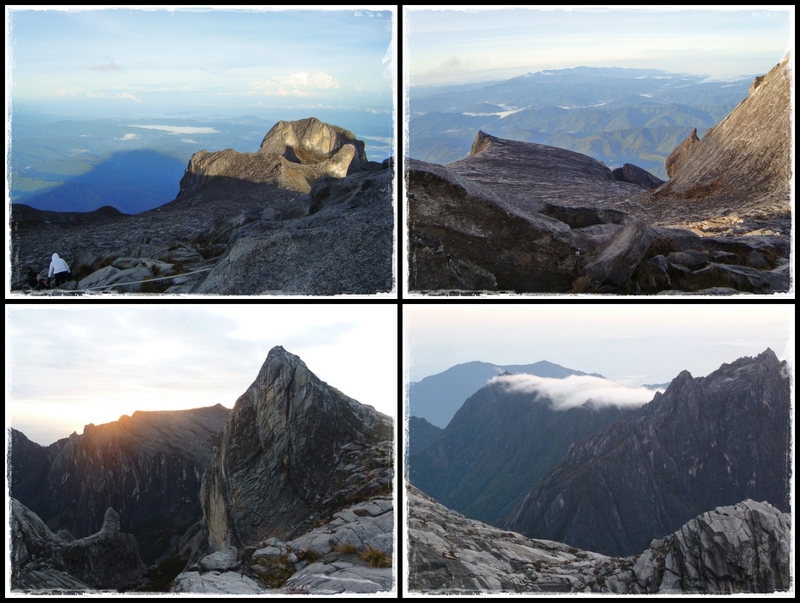 :p Anyway, the only highlight of this trip for me was to hike Mount Kinabalu...didn't get to go to any of the islands due to shortage of time. If I had more time, I would even make a trip to Brunei...you know why...hahaha!! Finally arrived Kota Kinabalu at 5pm. 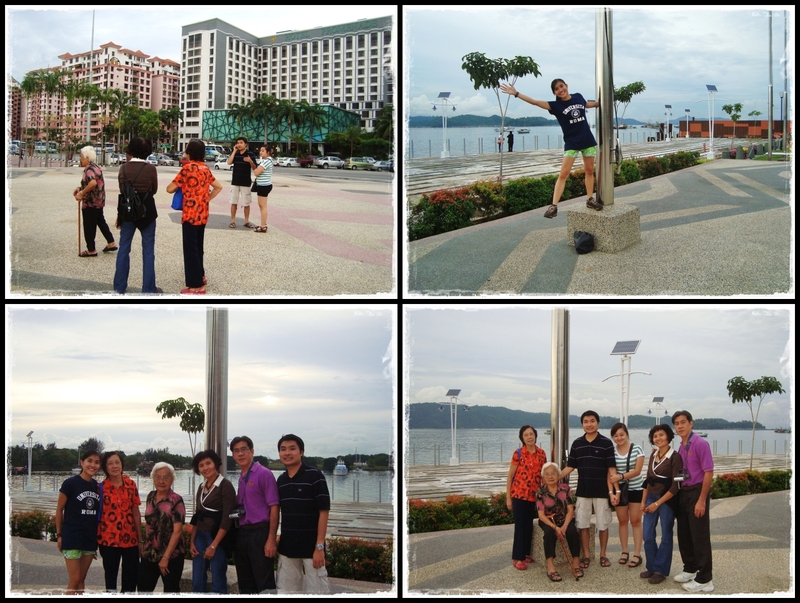 We decided to stop at the nicer part of the Waterfront for a group pic. 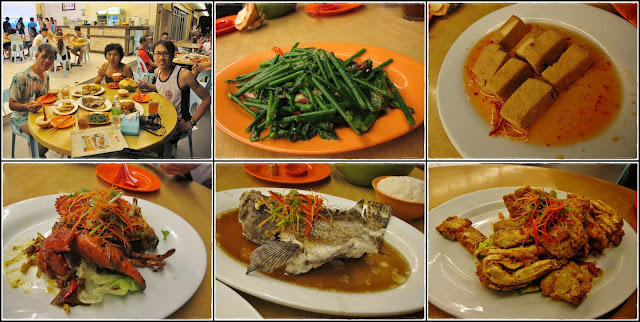 Seafood dinner at Ocean Seafood Village. We rented an apartment since there were 8 of us...best of all...the 'aunties' liked it coz they can cook. 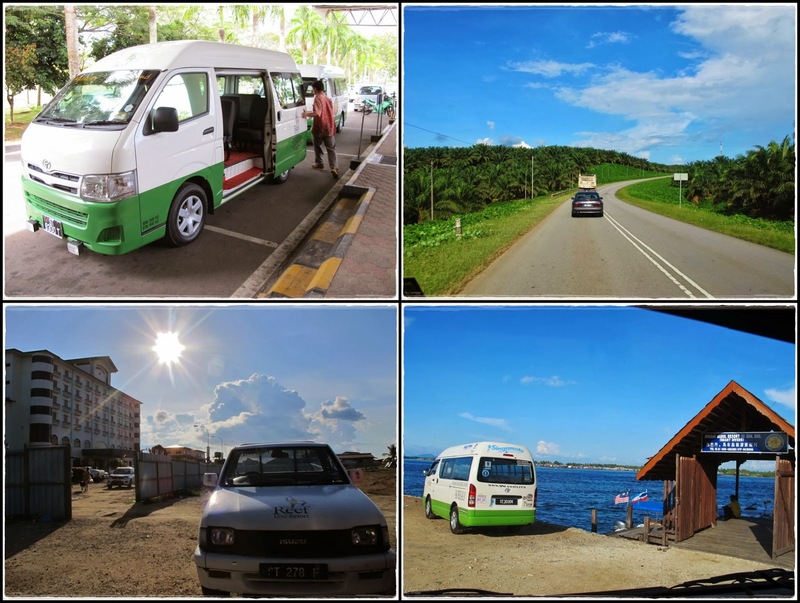 We hired a van for a day trip to Kinabalu Park as it takes about 2 hours to get there from Kota Kinabalu. That's also the starting point for our hike to the peak of Mt Kinabalu. Kinabalu Park covers a wide area and Mount Kinabalu is just part of it. 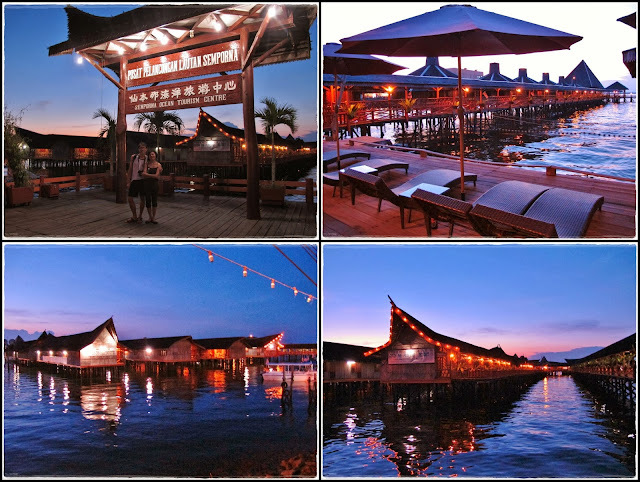 It's recognized as one of the UNESCO World Heritage site because of its rich biodiversity. I was trying hard to get a good picture of the peak all along the journey and it wasn't easy coz the driver was driving like a roller-coaster. Nice hilly valley sceneries along the journey. 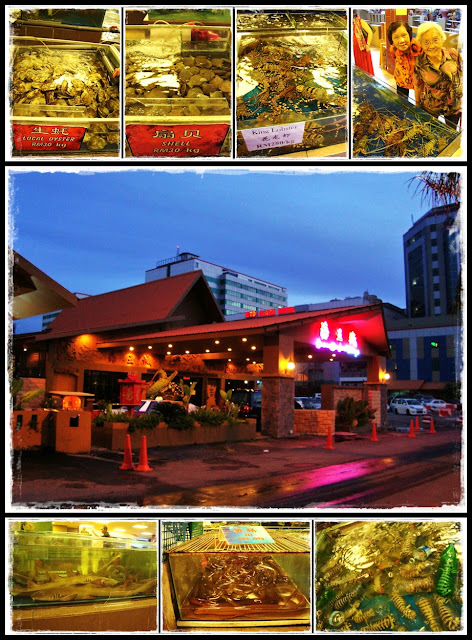 Another attraction in Kinabalu Park...Poring Hot Springs. 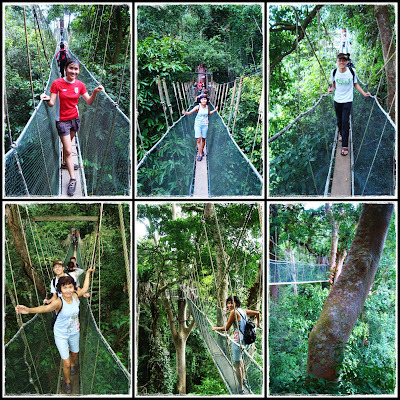 Went for a short hike to reach the Canopy Walk...nice canopies as u can see in the last pic. 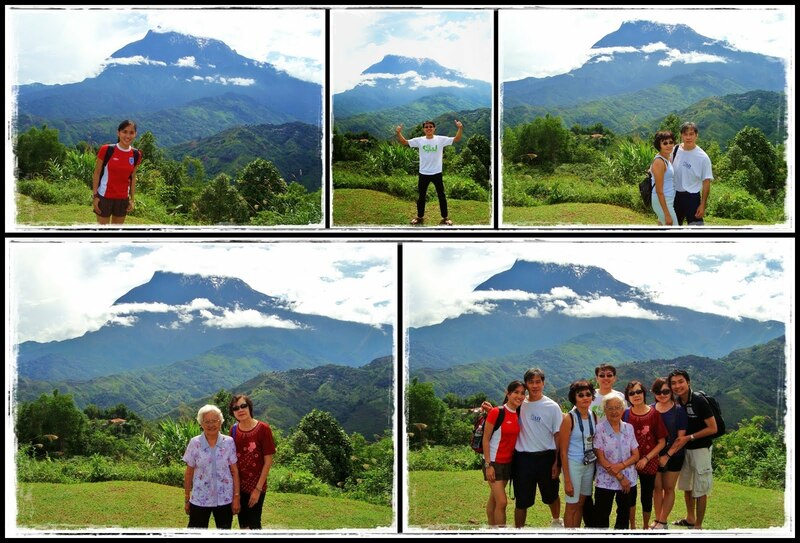 Another family pic with Mt Kinabalu. :p It was misty most of the time...I had to sit beside the door and waited for the mist to clear off then quickly take a pic. Interior of our chalet...we used the fireplace to heat up the room. 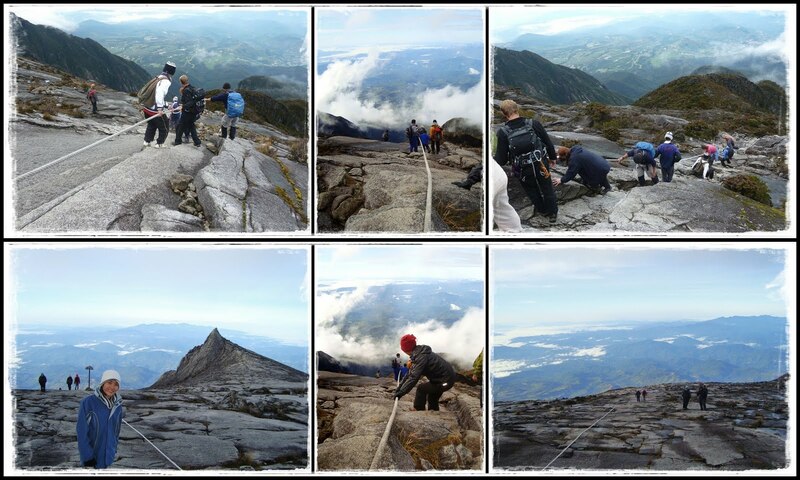 It does not require any special skills to climb, but it definitely requires stamina...luckily I did some physical preparation with hiking, gym, netball and badminton. 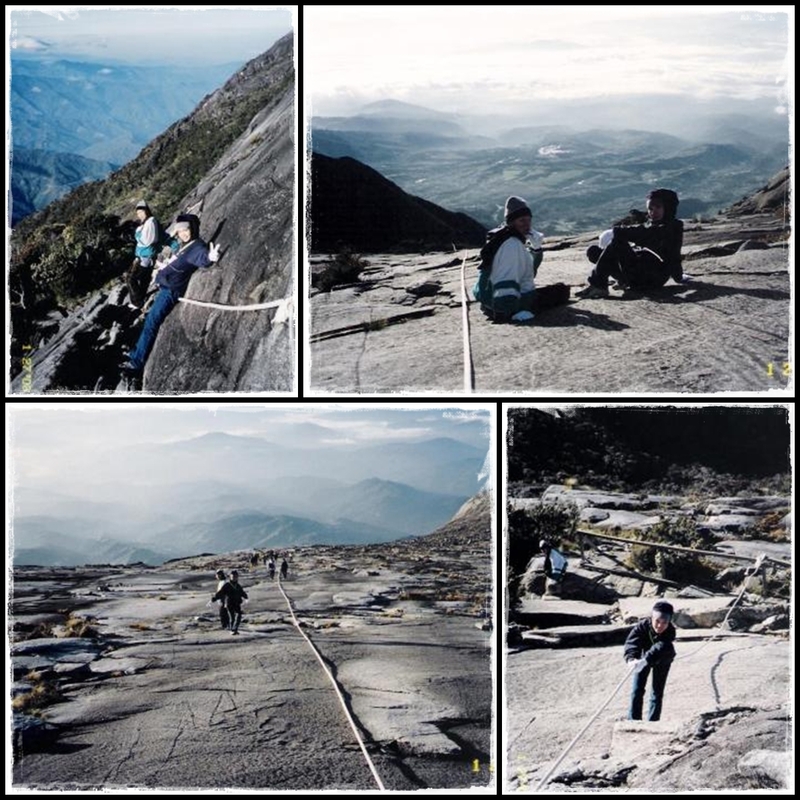 Typically, most hikers take 2-days to climb Mt Kinabalu and spend a night at Laban Rata or Gunting Lagadan resthouse before continuing our journey to the peak. 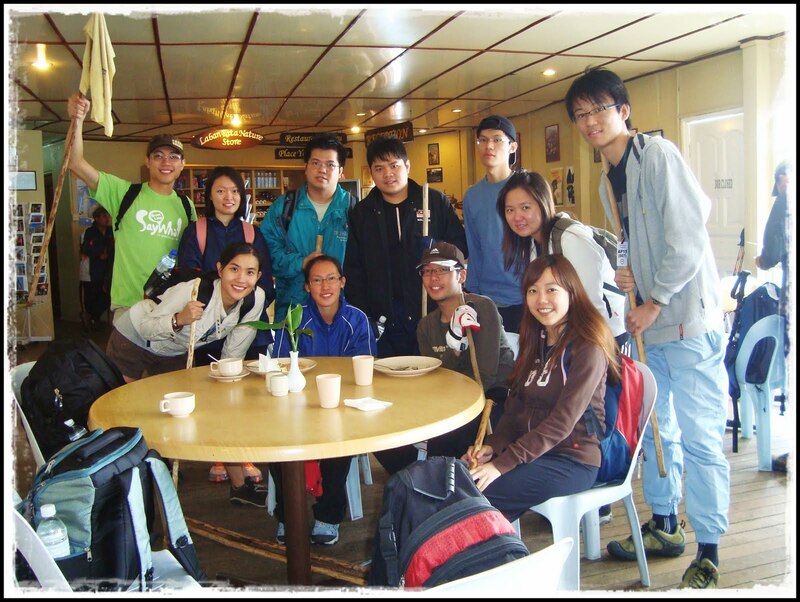 As the hostel can only accommodate about 150 ppl per day, early booking is required to climb the mountain. Luckily there were several shelters along the way for us to rest...it was uphill climb all the way...imagine climbing up the stairs non-stop for 6 hours. =.= Saw an porter carrying 40kgs of garbage down the mountain...they do this everyday to keep the natural environment clean...tough job...salute!! It's pretty interesting to see 4 different landscapes along our journey coz of the different climates. At the earlier part of the hike, it was still all green but as we got higher, the color changed into orange-cinnamon and the plants are shorter. It started drizzling after lunch but we still had to continue our hike coz we've still got a long way to go...luckily everyone brought raincoats. 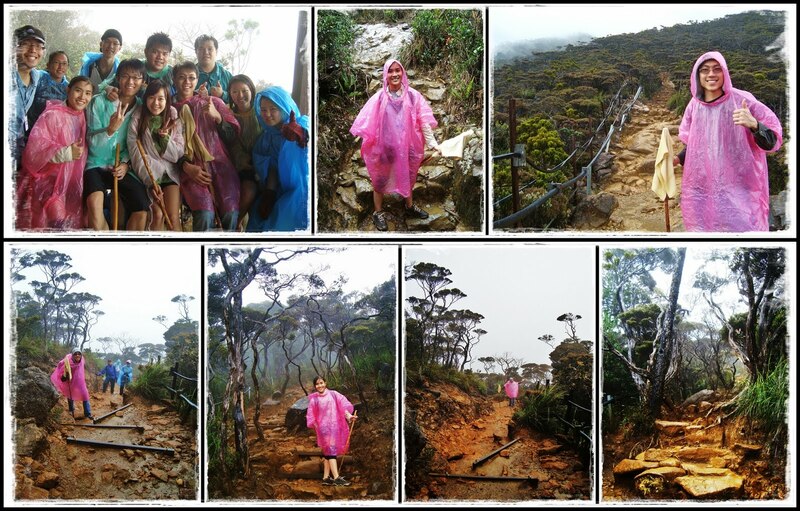 It was definitely tougher hiking in the rain coz it was muddy and slippery. Bro &amp;amp; I was a ahead of the others so we managed to reach the next shelter before it started pouring. Some of them were really soaked by the time they got to the shelter. Luckily the rain stopped shortly after. As we climbed higher, the landscape changed again...this time it was rocky. The surrounding was also misty as the weather turned colder. The first 750m was a series of wooden ladders and the remaining 2km was only ropes and bare granite slabs. 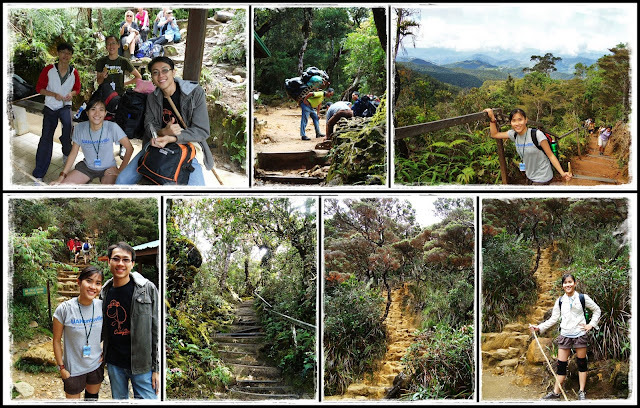 Some places were very steep (almost 70 degrees) and dangerous. I really held on tight to the rope for my dear life. 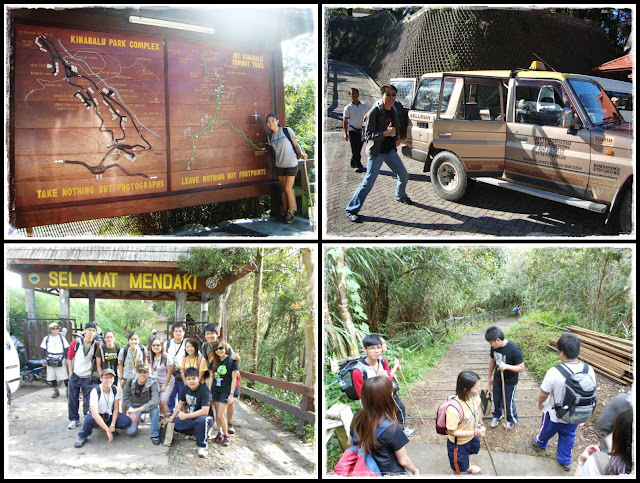 Besides, my shoe wasn't really suitable for hiking coz it had no grip and I almost slipped off at some places...luckily I wore bro's jeans and used it to add some friction as I pulled myself up at those steep areas. I don't even dare to imagine what would happen if I really slip and tumble downhill. =.= Coincidentally, that day was the 15th of the lunar 'ghost' month and that was when the 'death gate' is opened (ok I know this is lousy translation)...thank god everyone stayed safe. 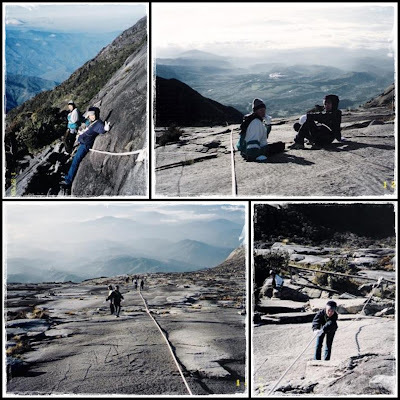 'Breaking dawn'...2km of granite slabs was really long and endless...it was really exhausting coz we couldn't see our destination (the peak) due to the mist and we just had to keep climbing uphill. 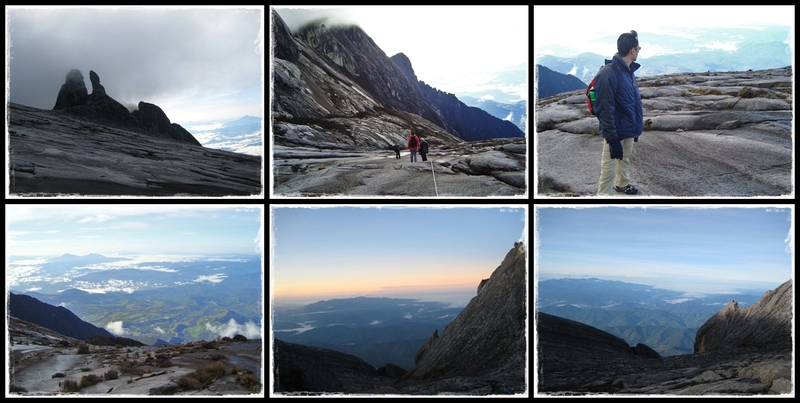 The thin air and cold wind blowing in your face makes it more challenging. 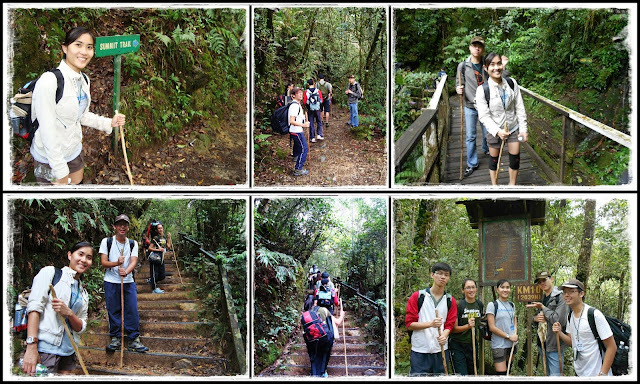 Passed by South Peak and St. John's Peak...we're almost there!! 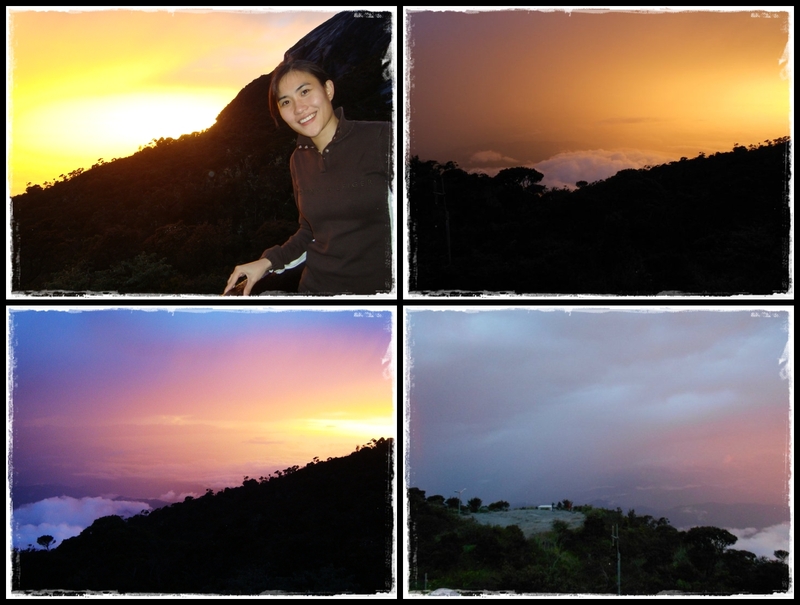 The sky was turning bright but we could still see a full moon (bottom left pic). Awesome view! 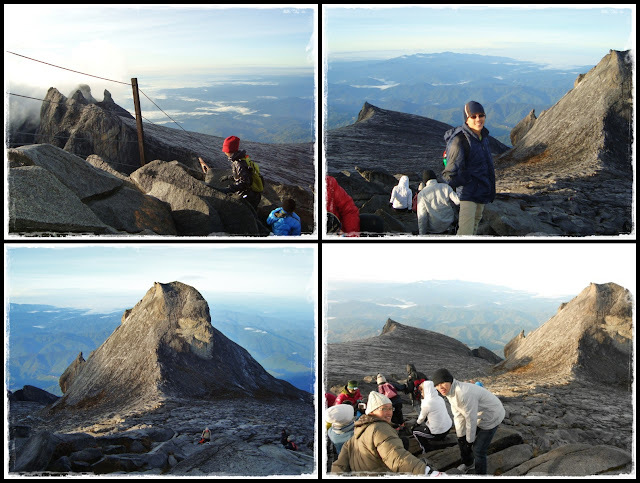 Finally...few more meters to the peak!! That pile of rocks is Low's Peak! It was too misty so we didn't manage to catch sunrise. 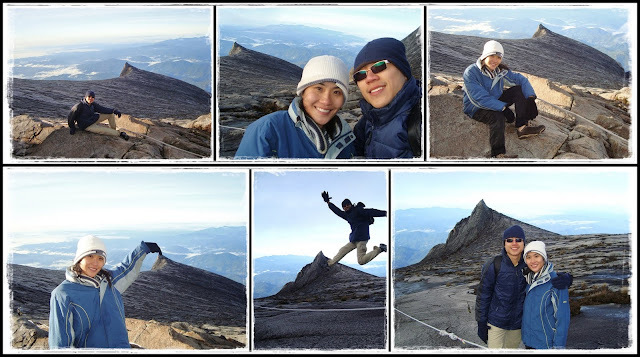 Oh yeahhhh... the Twincredibles have conquered Mount Kinabalu!!! We've all made it!!! All the effort just to take a pic with these 2 signs...lol!! 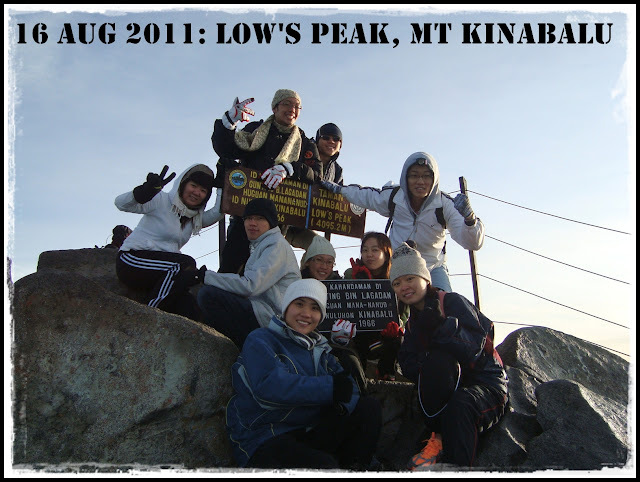 Fyi, Low's Peak was named after Sir Hugh Low but it wasn't him that set foot first on the peak. 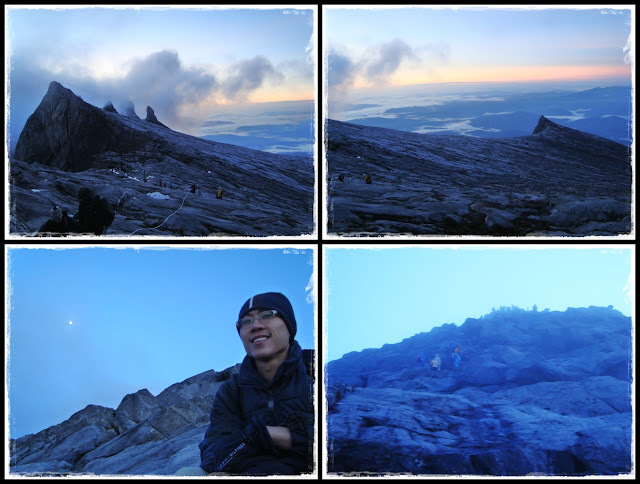 Gunting Lagadan was the first native to set foot at the summit. Magnificent view from the peak!! Can you spot the gorilla's face?? Camwhoring with South Peak. :p You'll be able to see this peak on your RM1 notes. Amazing scenery on the way downhill. 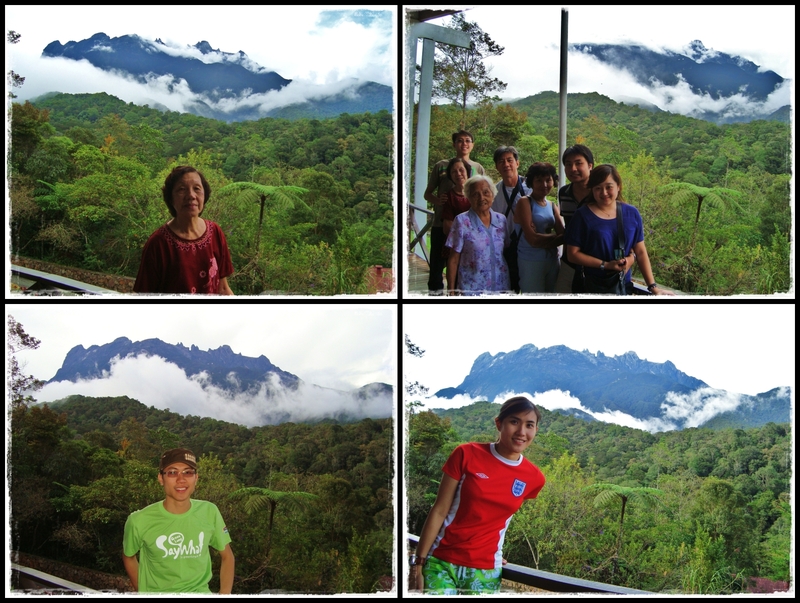 We were high above the clouds and mountains! Found some good pics from this site. Back at Laban Rata to pack our bags, eat breakfast &amp;amp; prepare ourselves for the 6km descent. It was raining again our entire journey downhill. =.= It was muddy and slippery all the way. Going downhill was easier but it was straining on both our thighs and knees. 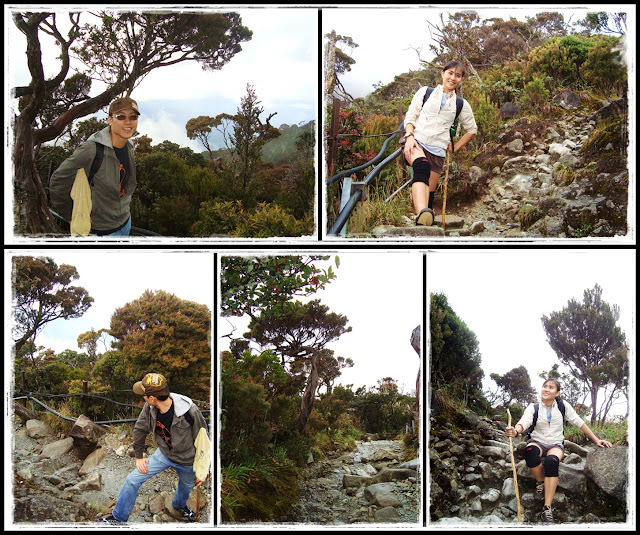 My left shoe already 'opened its mouth' before I arrive Laban Rata but our guide helped me to repair it using the shoelace. This enabled me to walk for another 5kms. :p The last pic shows how my shoe 'died'...haha!! Byebye my Nike! Back to KK town &amp;amp; stayed at Pacific Sutera Hotel for a night before flying back to Penang. Famous Fish Head Noodles in KK.